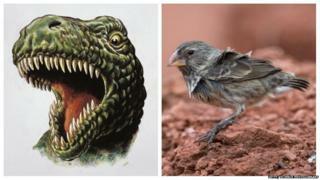 The Tyrannosaurus rex is known as one of the most fearsome creatures to have ever lived, but a new study suggests that the Galapagos large ground finch could give the dino a run for its money. According to scientists at the University of Reading - the Galapagos large ground finch was found to have jaws 320 times more powerful than the T. rex, compared to it's body size. The finch weighs just 33 grams and stands only 6 inches tall - a massive difference to the eight tonne T. rex! But Dr Chris Venditti, co-author of the study, said: "The 'King of the Dinosaurs' would be no match for a finch in a fight, if they were the same size." This suggests that the the evolution of T. rex was not led by a strong need for a bone-crushing bite to kill its prey. Instead, it had a bite force that was completely average for its body size. Supercomputers were used to analyse the largest ever collection of bite force data from 434 species of animals both extinct and surviving. The study was done to get an insight into how and why animals evolve and the speed at which they do so. The Big Question: Can we bring dinosaurs back to life? 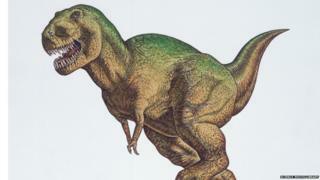 Although it the T-Rex is bigger and stronger than a bird the finch can fly away so would win the fight!